Rena is part of the Breakfast-In-The-Bag program and received special grocery items for the holiday. 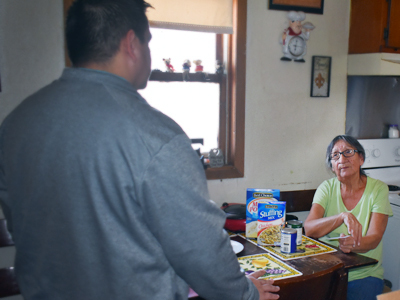 Rena lives in a community 50 miles north of the tribal headquarters of Rosebud in South Dakota. Even though a highway is less than a mile from her house, she is still fairly isolated from a grocery store or even a gas station. Rena is part of the Breakfast-in-a-Bag program. 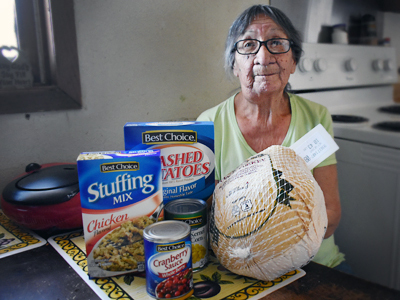 Instead of the normal groceries, the participants receive special items for the holiday to help them enjoy a good meal with family and friends. The cancer wasn't diagnosed right away, but when she went back for more testing, it was diagnosed and ultimately moved into her lungs. “I am on chemo every day and every three months they do a CT scan. I’m doing ok,” Rena shared. She was even grateful for the type of treatment she received. She said, “I was lucky there too with the pills. I could be sitting there (in the hospital)” for her treatment. Rena’s secret to preparing turkey was to “cook it breast up and then turn it over to make sure the bottom gets done.” She likes to eat the tail, which was nice and crispy. The other family members liked the breast meat. She enjoyed the company of her adult children, as well as her grandchildren and great-grandchildren. She worked on a farm when she was younger but mostly sewed beautiful quilts. She commented, “All I know is how to sew, none of this ‘computer’ business. My grandson is good with them though… all those quilts — that was my hobby. I enjoyed it, I miss it-part of me is missing. I have cataracts, but I still see.” She passed the skill onto a couple of her children and continues to sew. Rena has been a Breakfast-in-a-Bag participant for seven years. She said, “I was happy to get on it, it’s something good — very nutritional. All those snacks are good. I’m diabetic I enjoy the snack bars and fruit. It’s a lot of help.” Being a cancer patient, on top of diabetes, limits certain foods. “I can’t eat dairy products with the chemo and it really upsets my stomach,” she explained.